The journey to create a Tiny House in the Hunter -originally published in the Newcastle Herald, Photos by Max Mason-Hubers and Lily Ray. Some mornings I wake up with sawdust in my hair. There are bent nails in the pockets of all my clothes. I dream about ceiling quad and Spac Filler and No-More-Gaps. 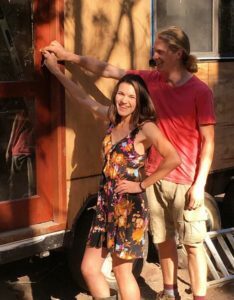 My husband, Felix, and I just spent eight months building a “Tiny House on Wheels” in the Australian bush. We live between his home country of Sweden, and mine – Australia, so living arrangements for the last three-and-a-half years, usually involved living with parents and in-laws. While the company, support, and home-cooked meals were all lovely, we started to long for something of our own. Earning half an income between the two of us at the time, a home loan and mortgage weren’t options we were comfortable with, and would have made travel back and forth much less doable. Enter the Tiny House Movement. As an active member of the millennial generation, I spend a fair bit of time on the internet. It was during one of my endless scrolls on blogging platform Tumblr one day that I came across my first tiny house. On wheels like a caravan, but shaped, built and insulated like a house, I was intrigued by the structure’s beauty and utility. Tiny houses can be any small home, but are often movable and usually defined as having around 120 square feet or less of livable space. Most have lofts, plumbing, electricity and composting toilets, and many are self-built. Felix was impressed by the photos and the concept and it wasn’t long before we were watching endless video tours on Youtube and sketching up floor plans. It started innocently enough. It was what ifs and hypotheticals and pipe dreams. But, financially, the numbers added up and, pretty soon, we were shopping for trailers and second-hand windows. We started building in August 2016 and, eight months later, we were tiny homeowners (or maybe tiny-home owners) and our “mortgage” (a debt to my parents) is under $20,000. Felix and I had never done anything handier than installing shelves, but the cache of “how-to” videos online and truly supportive family convinced us it was worth giving owner-builder a whirl. We were fortunate to have the opportunity to build on a beautiful family-owned rural acreage near Gloucester in the Barrington Range. My brothers and I grew up between there and Newcastle while my parents built a holiday house in the friendly country community. The site is located adjacent to the Barrington River, which provided an endless supply of drinking and bathing water – always lovely, but particularly valuable during the building process, before the water tank was installed. There was no power in the beginning, so we got hold of some smart cordless power tools. We used a substantial Milwaukee brand kit with 18v batteries and all with brushless motors. All that mechanical jargon actually began to mean something to us partway through the build. The drill, screwdriver, and circular saw were completely invaluable, as were the reciprocal saw and multitool. The two batteries held power for an unbelievable length of time considering the heavy duty, daily use they received. Other indispensable tools included hammers, chisels, handsaws, clamps, sawhorses, nail and roofing punches, spirit levels, roofing squares, caulking guns, measuring tapes, rulers, a reliable extension and stepladder, vice-grips, pliers, shifting spanners, a socket set, tincutters, pincers, stringlines, bevels, a planer and a belt-sander . . . the list goes on and on. Before we began this enormous project, I barely knew what half of those things were, let alone how to use them. Our knowledge and experience of tools and building increased at a tearing pace. It was the single biggest learning curve of our lives, and one we’re extremely proud of, but it wasn’t all smooth sailing. One frustrating Tuesday was spent waiting at the house for eight hours for a plumber who never showed up, without reception to ring and ask what was going on. A drive into reception later revealed the truth. “Ah. Yeah. I didn’t show up,” he said, helpfully. The following week was better, with only a four-hour fruitless wait. Trouble with tradies showing up on time, however cliched, was one of the most frustrating parts of the build, but one shared by owner-builders the world over. We became adept at finding creative solutions to bizarre problems and honed our skills in arguing with tradies who liked to insist things could not or should not be done. Before the solar was installed, a typical day saw us brewing a cuppa on the camping stove, washing ourselves in the river, and getting to work on whatever seemingly impossible task we happened to be up to. First, it was framing, which was both extremely logical and also somehow almost impossible to get right the first time. The thing with a Tiny House is that it’s . . . small. By the time we got really good at any given task, it was time to move onto the next. 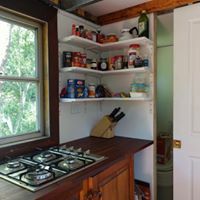 Next we built the loft platform, installed the Colorbond roof, plywood bracing and sheathing, Earthwool insulation, interior ply lining, a bathroom wall, second-hand hardwood weatherboards, and a host of other trying jobs. We had only minor setbacks, and encouraging success. Before too long, we had built most of the house. A tabletop mounted on folding brackets and folding dining chairs provide a dining area that can be neatly stored flat to the wall, allowing more room for a lounge, which we picked up free from Gumtree, and which was reupholstered by my talented mother. 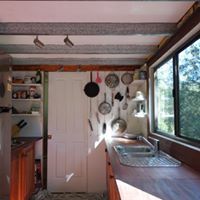 240 volt solar electricity, plumbing connected to a rainwater tank, a bit of paint, floating floorboards and a second hand kitchen made the place really start to feel like a home. Of course there are things we would do differently next time, but on the whole we’re beyond happy with how it turned out. We also learned a lot about ourselves, our relationship, our personal limits, and living simply. Tiny house living isn’t for everyone, and we were lucky that Felix worked from a distance so that we were able to dedicate the best part of a year to building our home. Tiny houses are certainly not unanimously beloved, with jokes about passing gas, spousal infighting, and washing your hands in the the toilet, but the reality of “living tiny” fit our lifestyle perfectly. 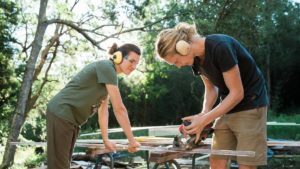 There are a million and one reasons for choosing to “go tiny”, from a desire to live mortgage-free, a love of minimalism and the ability to tow your home around the country, to concern for the environment, off-grid goals, hesitance to apply for a development application, or just the fun of building something slightly less complex and expensive than a fully-fledged house. Our reasons were a mixture of many of those and a few others stemming from a life between two countries. Most of the information about Tiny Houses available on the internet is American, and it can be hard to find out about local businesses and Australian building specifications and the law surrounding these structures. 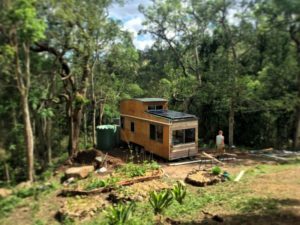 To combat this, I banded together with four other Australian women to create a Facebook group for Australian Tiny House enthusiasts, where people can ask questions, show off their builds, give advice and advertise their Tiny House services. With almost 4000 members joining since the group’s creation this year, the demand for more information is certainly there. Felix and I are living in Sweden for the foreseeable future and facing the sad reality that we’re just not there to use our little house. Sad as it is, the most sensible move for us right now is to sell it to someone who can love it and live in it and give it the attention it deserves.